1 x slice of watermelon. Our set of 5 hanging fruits is made to entertain your baby and encourage important development skills. Your baby will get so much joy from the sensations, sounds and visual delights these fruits give. ♥ The eye-catching colorful design will capture your baby's attention. ♥ There are rattles inside the fruits making them a fun distraction for babies as they learn how their movements can influence the sound. ♥ Soft gentle texture of crochet toys is perfect for tactile stimulation. Fruits help to develop a baby's fine motor skills. ♥ When a baby is out of a play gym period cut off the crochet strings and your toddler will have a set of separate fruits for playing with as a pretend food. Great for comfortable teaching kids healthy eating habits. Each fruit is hand crocheted from high quality 100% cotton mercerized yarn, stuffed with polyester filling and has a plastic rattle inside. Fruits measure from 1,6" (4 cm) to 3,9" (10 cm) in height. Fruits have 8'' (20 cm) long crochet loops for easy attaching to a play gym bar or most strollers, prams, car seats for on-the-go fun. SAFETY: Use the toy only under an adult's supervision. Toys with loops should be used as hanging toys only. When you stop using them as hanging toys cut off the loops. Check the toy every time before you give it to your baby. Très bien réalisé. Envoi très rapide. Pleinement satisfaite. 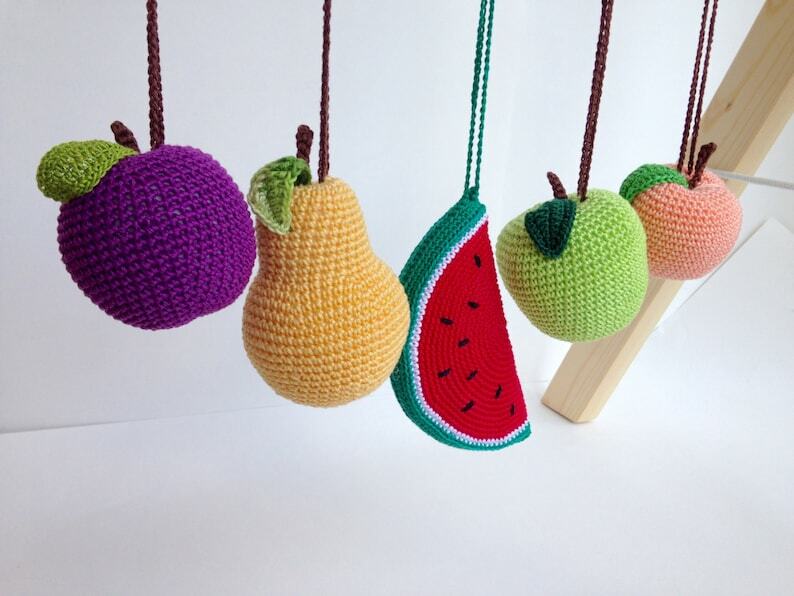 Really adorable little crochet fruits. Perfect to hang off our baby gym.